Intensive Correction Management Orders (ICMOs, discussed here) are going to go, without ever having been. In their place will be Community Corrections Orders (CCOs), for most purposes exactly the same thing. Using new powers under the CCO, courts may require offenders to pay a bond that will be forfeited if the offender fails to comply with their order. Courts may also impose up to 600 hours of community work, curfews and no-go zones, conditions on where an offender may live, prohibitions on contact with specified persons such as associates of the offender, victims, witnesses or their families, and exclusions from licensed premises. Courts will be able to apply these conditions in a way that addresses the circumstances of the offence and the offender, in order to reduce the likelihood of further offending or protect those affected by the crime. Courts will be able to use the new CCO to ensure that those who have committed serious crimes will no longer walk out of court free to continue their criminal behaviour with no restrictions or penalties. 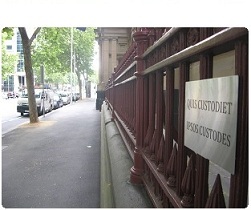 Courts may use the place or area exclusion to prevent offenders from going to a particular site or an area such as the CBD. Courts may also use the curfew condition to require that an offender stay at home for up to 12 hours a day to stop them going out at night or other times and engaging in further criminal behaviour. Under the alcohol exclusion condition, courts will have the power to ban offenders from entering or consuming alcohol in licensed premises. Offenders will be completely banned from going to nightclubs, pubs, bars, restaurants, cafes and function centres. Offenders will be able to access other types of licensed premises. However, they will not be allowed to enter the bar area and will not be allowed to drink alcohol anywhere in the premises. If they do, they will be in contravention of their order. Judges and magistrates will also be empowered to actively monitor an offender's compliance with their order through a judicial monitoring condition. Courts will have a broad discretion to manage offenders as they see fit -- for example, by requiring offenders to return to court for monitoring at regular intervals or just once. The judicial monitoring condition will allow courts to keep close watch over offenders' progress in completing the requirements of their order. Courts will be able to request progress updates from the offender, Corrections Victoria, prosecuting agencies, and other appropriate persons. Courts will retain their existing powers to order supervision of the offender by Corrections Victoria, order treatment and rehabilitation such as drug or alcohol treatment, or programs that target particular offending behaviour and reduce the risk of reoffending. This legislation passed the Assembly and made its way through the Council this week. The Bill will repeal combined custody and treatment orders, intensive correction orders and community-based orders, introduce a new community correction order, amend the Sentencing Amendment Act 2010 and make minor and consequential amendments to other Acts. The Bill itself is here, the Explanatory Memorandum here and Statement of Compatibility here. The Second Reading Speech was read in September, and can be found here. The legislation is a continuation of the government agenda discussed here. Parts of the Sentencing Amendment Act 2010 and Justice Legislation Amendment Act 2010 will be repealed without ever having come into effect. Although the government has repeatedly stated its intention to abolish home detention, the curfew and no-go provisions of a CCO make comparisons inevitable. It might be more accurate to say that home detention is being removed as a 'jail' option and made a 'community-based' alternative. It will be interesting to see whether magistrates adopt their new 'monitoring' function. Historically judicial officers have been reluctant to impose orders that require their ongoing supervision. It's likely that some magistrates will continue to rely on Corrections Victoria to track an offender's progress post-sentence, whilst others will take to direct supervision with enthusiasm. Most of the provisions have a forced commencement date of 30 June 2013. I should also briefly mention the Justice Legislation Further Amendment Bill 2011. Folllowing the vast increase in powers to be given to Protective Services Officers, this legislation will amend the Criminal Procedure Act to allow police prosecutors to represent them in their matters before the Magistrates' Court.